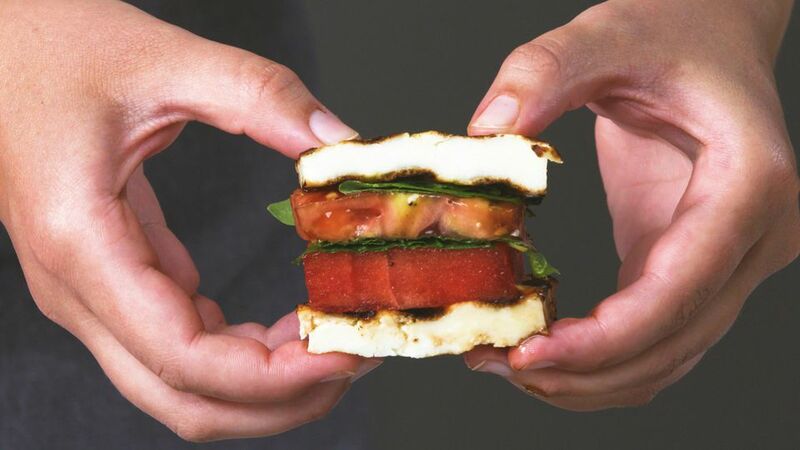 Grilled Halloumi and Watermelon "Sandwich"
Who knew that a cheese-as-bread sammie could be so refreshing? Here, grilled halloumi stands in for the bread, sandwiching mint, tomato, basil, fresh black pepper, and balsamic glaze. The result is a little bit salty, a little bit sweet, and just right on a balmy afternoon. Slice halloumi widthwise into quarters. One thick block of halloumi should give you about 3 to 4 slices of "bread." Brush olive oil on griddle, then grill cheese slices on both sides, 2 to 3 minutes until lightly browned. Meanwhile, cut the watermelon and tomato into square pieces, about the same size as the halloumi cheese slices. To assemble, place one piece of cheese, grill marks side down and cover with watermelon, mint, tomato, fresh black pepper, balsamic glaze and fresh basil, and top with the other slice of halloumi.